Prelude: TackleTour Gear Crew Member Matt Davis of Otterods, shares with us, some tips, techniques, and most importantly, gear, on his long overdue reintroduction into ice fishing. Introduction: Ice fishing has been an annual tradition with my friends and I since the 90’s when we were all in college. 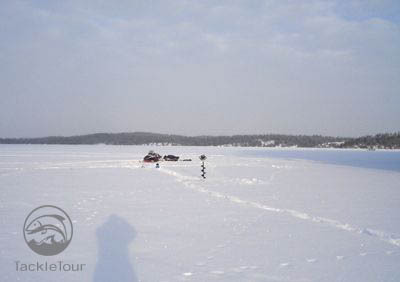 Each year, during the second week of January, we’d travel to North Western Ontario for some Lake Trout fishing on some of the region’s frozen waters. For various reasons and circumstances, I’ve missed out on this trip for the past 5 years, but this year was to finally be my chance to get back into the rotation. The Journey: Our journey to a remote location in Northwest Ontario began at 5:30am on a Friday morning with the seven of us loading our gear: 7 men, 7 snowmobiles, 9 sleds, 5 days worth of diesel for the generator, gas for the snowmobiles, fishing equipment, gear, and food all packed into 2 trucks with trailers. 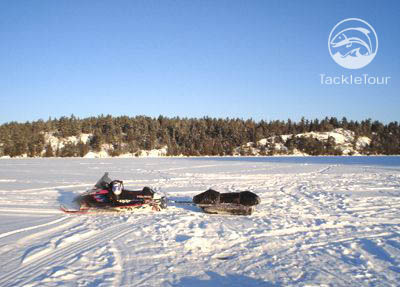 It took roughly 200 miles of driving to reach our staging point where we parked our vehicles then unpacked and repacked all our gear into our sleds for a trek across the lake. A 15 mile ride across the lake, and we arrived at our cabin around 1:30pm - 8 hours later. It was a very nice day for January with temps in the low 20’s. We unloaded our gear, brought it all into the cabin and a couple of the guys headed out to get an hour or two of fishing in before the sun set. The report from the last hours of fishable day light was very promising with several fish being caught. All of them great keeper sized fish from 24 to 27 inches. The next morning camp cleared out shortly after the sun was up. 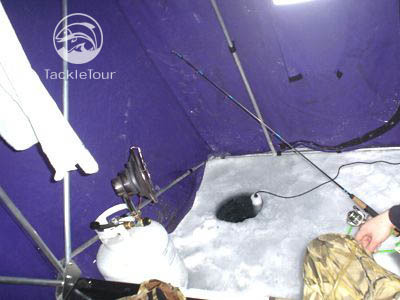 Low light fishing is typically unproductive when ice fishing Lakers, at least in our experience. So fishing happens while the sun is over the tree tops. 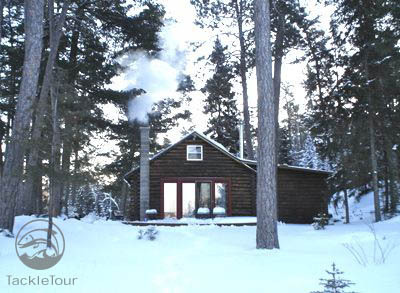 Most times a short break for lunch at the cabin is the only time during daylight hours that we’re not fishing. It was a balmy 14° that first morning. I traveled roughly two and half miles over the frozen lake to my first fishing spot; a place that had been quite productive for me the last time I was here. 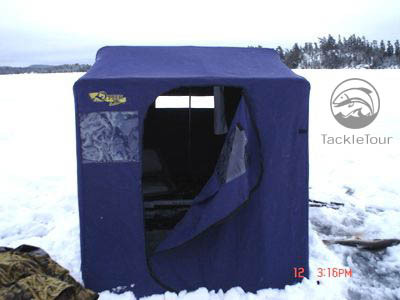 The Shelter: Many times early January brings the coldest temps of the year, so while we often fish outside in the elements, bringing a portable shelter along is a must. It’s not uncommon to see day time highs push up into the negative twenties. In these conditions, water freezes so fast your line can freeze in the hole before your lure makes it half way to the bottom! 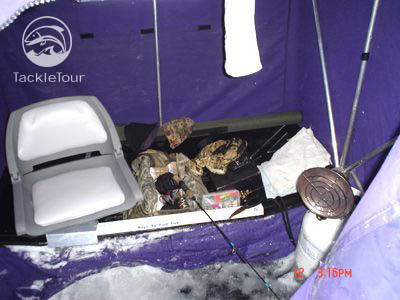 For shelter, I use an Otter Medium Cabin shelter from Otter Outdoors. The package consists of a heavy plastic tub, a rigid hitch for true towing and a flip over style canvas shelter. This format of shelter is quick and easy to set up and tear down. It tracks well behind a snowmobile or ATV even at high speeds. And can really haul some gear. On a normal day of fishing I have my auger, an ice chisel, an aluminum snow shovel, fifty feet of rope, a twenty pound propane cylinder with a heater, a depth finder, a big bag with miscellaneous gear and tackle, a rod case with two rods, a hole skimmer, and a gaff all packed into my Otter. Keeping in Touch: We all carry FRS radios with us. As a group, we are generally spread out enough that not every person can communicate with the entirety of the group. Often times messages need to be relayed thru one or even two people to get the message delivered to the intended person. It is common for us to have 10 miles between the furthest people in the party. Word quickly spreads within the group about where everyone is fishing, the productive depths, the hot lures, the attitude of the fish, etc. Not only is a radio a fun way to fish with a group, it is also a very important safety item to have. With the vast amount of available water to fish, the long distance from any form of help, the real ability to become wet and hypothermic at an instant, having the ability to communicate with the rest of your party is a very real need. 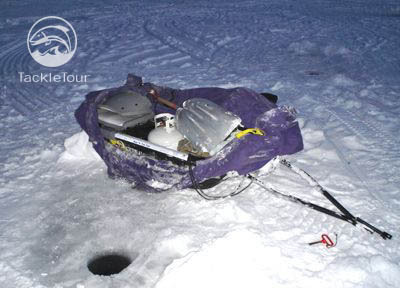 Time to Drill: To get through the ice and actually fish, I use a Jiffy 3hp gas power head on top of a 10” diameter auger. 6” and 8” augers are much more common. But I can’t imagine fishing Lake Trout thru a hole any smaller than 10”. With the average fish easily going 5 pounds and fish of 10 pounds being common, holes smaller than 10” can be a real challenge to steer a feisty Laker into. I know many anglers that even cloverleaf three holes and chisel out the center for one very big triangular hole. But you have to be careful using that method as its easy to take a swim if you’re not watching what you are doing! January is still early in the year by ice standards on this massive body of water. The thickest ice I was able to find was 12” thick. Checking the ice to make sure it's not too thin... 12 inches. Finding the Hot Zone: A depth finder is a very critical tool for winter fishing - especially for Lake Trout. During the winter months with oxygen levels being quite consistent throughout the lake, Lake Trout have the ability to roam the entire water column looking for food. You can find them belly to the bottom in 120’ of water and at the same spot see them breeze by your hole just a few feet under the ice. Using a depth finder makes finding the “hot” zone so much easier. The “hot” zone is the height at which the most active fish tend to congregate. While watching the depth finder you often see baitfish and/or larger fish using a certain depth. That’s your hot zone. I use a Vexilar FL-18 3-color flasher for my winter fishing. 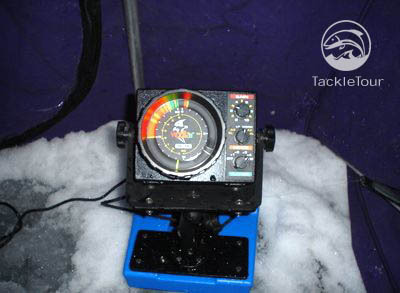 A portable flasher unit like this Vexilar FL-18 is an invaluable tool while ice fishing. This also pulls double duty for me and is mounted in the bow of my boat on my trolling motor for open water use. 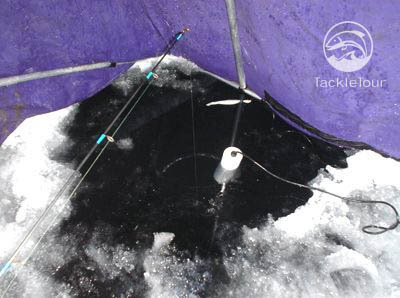 For winter fishing I use a dual cone transducer and switch it to the narrow 9° cone while fishing Lakers. With the depths I sometimes fish over and the erratic nature of the bottom, a narrow cone gives the clearest view of the bottom. 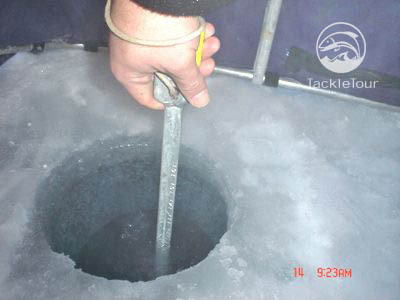 When scouting for a good fishing spot, pouring a little water on the ice allows the transducer to shoot thru the ice for checking depth. When fishing, I drop the transducer down the same hole my line is down. It is suspended in the water with a foam float. Having the transducer in the same hole puts my bait directly under the transducer and seeing the lure on the depth finder is important in this type of fishing.